Our Coffee Brown set of beads is a FANTASTIC rich Deep Brown color that you'll truly love. The header rod is a matching brown color too! It's so incredibly beautiful. There is NO iridescent coating on this curtain. The beads are see-through. I am a huge fan and am looking forward to doing business with you again. I have bought several beaded curtains for myself and my family. My best friend and I are going to buy more as she has chosen some beaded curtains too. My first purchase was about six years ago and the curtains are as nice today as the day I openend them. Thank you for your busines and we will difinitely do more business with you. Merchant Response:Wow, thank you so much for this glowing review. We work very hard to provide excellent product and customer service. You made our day! Quick service with quality products. Have always been very happy with gtoods I have received. 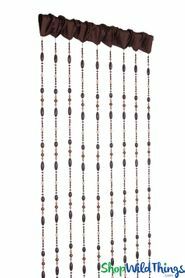 This is a very nice sturdy curtain with nice sized jewels/gems. It is exactly what I expected and was looking for as an entrance to my Zen room. Beaded curtain was exactly what we needed. We like to leave our screen porch door open for our dog to go in and out, but we were having problems with birds flying in and getting trapped inside the screened porch. Hung beads in the open doorway and have had only 1 bird come in since. I already have some of these curtains and wanted them for another space. They wear very well. I'm very happy. The beaded curtain is just what I needed to add some pizazz and serve as an innovative way to divide the entry between my living room and my kitchen. It's a great conversation piece, my guests love looking at it and my pre-school daughter is simply impressed by it. ProsIt's easy to hang and very durable. ConsIt takes a while to untangle before setting up. ProsGood quality, exactly as pictured and described. Excellent price. ConsA wee bit difficult to hang as it was somewhat tangled when removed from the package. But only took about 10 minutes to get everything straight and hanging. Doors Open - Birds Out! I bought these to hang over my screen porch doors. They matched my sheer panels that I have for privacy over the windows, but I needed something that would confuse any birds that might want to make a nest in my porch area (happened last spring). I have a dog that I would like to allow to go in and out at will, and I didn't want to build two doggy doors, which would have been expensive and not nearly as bohemian!!! I love the look, and my guests do too! So far, so good on the bird nests! ConsNot quite long enough - I should have measured the opening, but I figured the longest ones would fit! 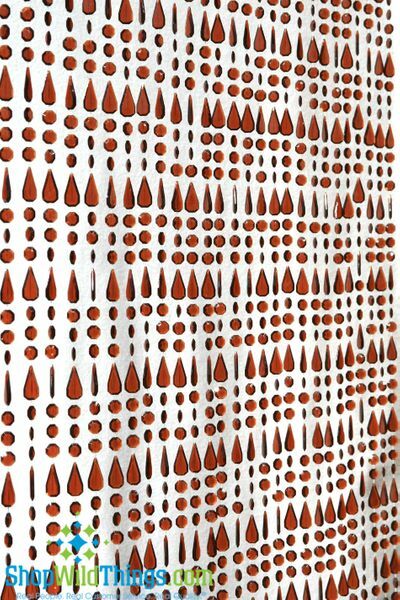 I love these beaded curtains! I have them in my bedroom . I used the hooks to hang the beaded curtain over my curtain rod that I had shears on then I layered more curtains over that. They are beautiful.you can do just about anything with these. If you want a really unique look that you don't see everywhere these curtains are for you! These beads are really pretty. They were easy to hang and now they look great. This curtain is AWESOME!!! Had to shorten the width to make it fit where I wanted it to go but with the tutorial on this 'Shop Wild Things' website, I was able to do it quickly and with much ease. Looks great! ProsGreat quality, easy to hang, easy to shorten width and looks great. I got two of the same kind of beaded curtains two divide two of my rooms, which have no doors. When I walk into my home they are the first thing that I, and my guest see. I love the way they bring a change to my home. ProsEverything, they are better then having a door to divide your rooms. Beautiful color ordering more!! Great shipping-arrived as expected! !